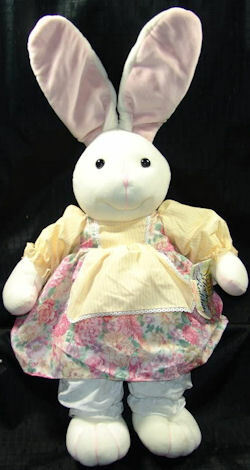 I’m looking for an early 90’s Toys ‘R Us white cotton rabbit with floppy pink ears. It could be seated, but did not stand. From ear to foot it was 28 inches long. It had hard plastic black eyes, a white thread nose, pink soled feet, U shaped hands, and was filled with a very old stuffing. She was wearing a white pair of pants with a nice white and pink shirt that had a slight floral print on it and frills on two sides that came down to have a little sash in the front. When I was very young my parents bought me this stuffed rabbit for Easter, just like any other kid right? I would never have thought that this rabbit would last me 20 years! She has been through everything with me. She has been with me through my parents’ divorce, on countless road trips, has been cried over, fought over, and kept me strong throughout the years. There was a time in my life when, if I was not with “Bunny”, or “Bun Bun”, anyone around me was in a living hell. My mother and father can recall countless nights that they had to travel from Florence, SC, to Georgia and back again just to bring home “Bun Bun”. This rabbit means more than the world to me. I’ve looked everywhere. I’ve even called the Toys ‘R Us Corporation in New York City to find her, with no answer back. I cannot even find a photo of her ANYWHERE. YOU FOUND HER~ mIS kATHY YOU ARE AMAZING THANK YOU SO MUCH FOR FINDING MY LITTLE BUN BUN !